Alaska is one of the premier gold mining destination in the world! Want to learn more about where gold can be found in this great state? Alaska Gold! – The Richest Gold Districts of the Last Frontier takes a look at the some of the richest historical mining districts throughout the state. 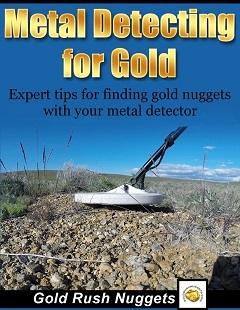 Hundreds of creeks, rivers, gulches, and mines are mentioned in this eBook that have all produced gold in the past, and will lead you to places to find gold today. There is still gold out there buried in the earth just waiting for someone to go out and dig it up! Since Alaska is such a massive state, and the gold-bearing locations are scattered across such a vast area, this book focuses primarily on the districts that have produced the most gold since their discoveries, and areas that area still being successfully mined today. Some of the mining districts covered in this eBook are the Juneau, Porcupine, Koyukuk, Ruby, Circle, Fairbanks, Fortymile, Iditarod, Innoko, Nome, Valdez Creek, and Willow Creek mining districts. Right now you can purchase this awesome resource for gold mining in Alaska for the low price of just $7, regularly $12. Think about how much money you spend on gas these days just driving into the hills searching of gold and you will realize that $7 is a heck of a deal! No wasting time and gas money wandering aimlessly in your search for gold! Now you will know some of the exact places where gold is found in Alaska. The following information is included as a part of your eBook! 30-day Guarantee! We know that this guide will help you learn about areas to prospect for gold in Alaska. If for any reason you are not satisfied, we will gladly give a full refund. 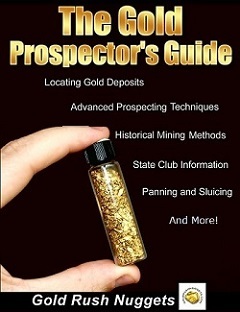 We offer this 30-day guarantee because we know that this eBook will help you find some great places to look for gold! Alaska Gold! 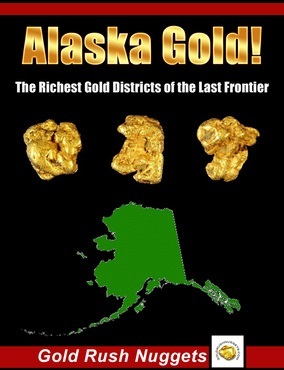 The Richest Gold Districts of the Last Frontier - 40-page eBook about where to finding gold in Alaska. *The Alaska Gold! eBook will automatically be emailed to you as a printable PDF after purchase. No waiting and no shipping charges.